How to Play Blu-ray Movies on iPad On-the-go? If you’re a movie fan, you may have purchased many of Blu-ray Discs because of the full quality. In the past several years, the only way you could enjoy the 1080p Hollywood films and popular TV shows is though your home theater center. However, in 2015-2016, Apple has announced its two generation of iPad Pro – new 9.7-inch iPad Pro and 12.9-inch iPad Pro – with the same Retina display. That could’t be better than watching any kinds of Blu-ray with the high quality on your 9.7-inch iPad Pro or 12.9-inch iPad Pro on the go. This page will share you the easy solution to guarantee Blu-ray playback on iPad Pro successfully. Stay on. It is really cool to play Blu-ray on iPad Pro, Why? Just imagine that you’re on an airplane, subway home or right lie in living room bed, pull out your iPad Pro, and fill your leisure time with Blu-ray movies. You can watch up to 10 hours of Blu-ray on iPad, so even the longest flight will fly over. Or think about it in another case: If you miss the films for theatrical release, when these films come out on Blu-ray, you can enjoy the Blu-ray movies on Apple iPad Pro (9.7″/12.9″) in anywhere and anytime with the high quality instead. Even though, same as the other tablet, iPad Pro doesn’t have a Blu-ray ROM drive. That is to say, Blu-ray cannot be watched on iPad Pro directly, and that’s the problem for all of us. However, just make a digital content of the existing Blu-ray, you can enjoy the full quality Blu-ray movies on iPad Pro, though. Especially for those who take a long flight or road trip, enjoy the digital copy of Blu-ray on iPad proved to be a life saver to spare time. All you needed is a Blu-ray Disc, Blu-ray ROM drive and a Blu-ray Ripping tool. I would like to say ripping the contents of Blu-ray to iPad is actually extremely easy. Today, we’re going to introduce you a nice tool I used to rip high definition 1080p Blu-ray movie files for iPad Pro. Blu-ray to iPad Pro Ripper, What Are You Looking for? There always lies variety of Blu-ray disc copy-protections before trying to rip Blu-ray to iPad Pro, such as The Image Constrain Token (ICT), The ROM-Mark, and so on. And you need to get help from a Blu-ray Ripper which is constantly update to defeat upcoming Blu-ray encryption technologies. If the Blu-ray to iPad Pro Ripper prepares specific iPad profile settings, it will save you a lot of time to find complicated parameter settings. (Due to strict video/audio requirement, iPad only accept V/A with special tech specs). A top Blu-ray to iPad Pro Ripper will offer you most favorable HD viewing experience, say excellent output picture and surround sound in the Blu-ray to iPad Pro conversion. Brorsoft Blu-ray Ripper for Windows | for Mac support fully remove any protected Blu-ray with MKB, including MKB V1 to MKB V62 so that you can rip all Blu-ray to iPad Pro compatible H.264, MPEG-4 and Motion JPEG videos in formats .m4v, .mp4, .mov with high quality. Also, you can fully adjust parameters to control iPad Pro video quality and file size. What’s more, you can use this Blu-ray converter to crop the black bars, add special video effects, split or merge video, etc. And the conversion speed is 6X faster than other ripping tools. How to rip Blu-ray to iPad Pro via simple clicks? As the saying goes, “Actions speak louder than words”. Follow the user guide and you can find the easiest way to rip Blu-ray to play on iPad Pro 9.7/12.9-inch Retina Display. This guide uses the Windows version screenshots. Mac Version has the same functions except the tiny differences in interface. Just make sure you download the right version. All you need to do is to select a Blu-ray, set iPad Pro profile and start ripping Blu-ray. Then you can watch any Blu-ray content on iPad Pro with ultra high definition effect. Windows Version Brorsoft Blu-ray Ripper take as example, Mac Version share the same steps, just keep in mind you have download the right version, Windows platform .exe files cannot be installed on Mac OS – and vice versa. Install and run Blu-ray Ripper for iPad Pro to Your PC. After you insert a Blu-ray disc into the computer Blu-ray drive, back to the software interface and click “Load file(s)” button. Then it flashes right to you preloading the Blu-ray content. And you’ll notice that among the several titles there’s a title ticked off. It is the main movie. You wouldn’t have to consider other titles. Option 1. Click “Format” and Select an Output Profile for iPad Pro. 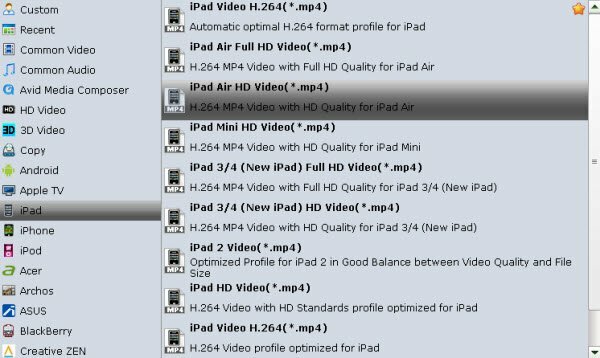 Here you can select “iPad > “iPad 3/4 (New iPad) Full HD Video(*.mp4)” as output format. The output videos will reserve maximum quality. Option 2. Just click on the dropdown menu of “Format”, and then choose H.264 MP4 from Common Video profile list, Galaxy Tab S3 support H.264 MP4 well. If you want to keep 1080p resolution as source movie, you can choose HD Video > H.264 HD Video(*.mp4) as output format. Tip: If you like, you can click on settings you could easily set bitrate, frame rate, codec, channels, sample rate, etc to adjust parameters that affect video quality and file size for the video you prefer. keep in mind that bitrate higher results in big file size, and lower visible quality loss, and vice versa. Optimization settings – The default settings may not satisfy you, you can click the Settings button to change the setting by the yourself. Keep, please note the size and quality of the file to convert more than a resolution based on the bit rate (bit rate in the relatively large files the results of high dimension, and reduce the loss of visual quality, and vice versa). On this last step, you just need to press the “Start conversion” button to begin digitizing Blu-ray to iPad Pro acceptable formats. After the conversion, you can click “Open” to locate the ripped video files and can transfer the converted video to iPad Pro. Now you are allowed to play and watch Blu-ray on iPad Pro wherever and whenever you please. The powerful built-in speaker will make iPad Pro perfect for Blu-ray experience with friends on you hand. In addition to Blu-ray, Brorsoft Blu-ray Ripper allows you to rip DVD to any types of format iPad supported, as well as Android, iPhone and iPod devices.You can choose to customize your videos as you like. The built-in editor will make your videos more wonderful. A professional yet easy-to-use DVD backing up and ripping tool. A professional yet easy-to-use DVD backing up and ripping tool. This entry was posted in Blu-ray and tagged blu ray on iPad pro, blu ray to iPad pro, iPad pro blu ray player, iPad pro blu ray ripper, iPad pro video format, play blu ray on iPad pro, rip blu ray to iPad pro video, transfer blu ray to iPad pro, watch blu ray on iPad pro. Bookmark the permalink.